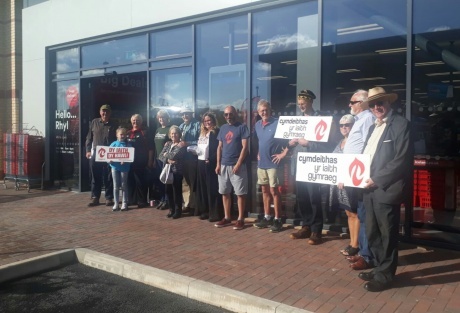 A group of campaigners have disrupted the official opening of a new Iceland store in Rhyl today (Tuesday, 31st July) over a lack of Welsh language provision. On the opening morning of the new shop, fifteen members of Cymdeithas yr Iaith along with local Councillor Arwel Roberts protested outside and inside the shop, complaining to managers about the lack of Welsh language signage. The company's first headquarters was in the Rhyl area back in the 1970s. “Your must have been to a party where the family has forgotten to bring presents for the guests. Well, that's what we've got today – Iceland has invited us all over, but has forgotten to bring the Welsh signs to show respect to Wales. We look forward to seeing a full Welsh language service here in the near future. "One of the biggest Welsh-medium primary schools is within a quarter mile of the new shop and the law gives official status to the language in public life, although the present Labour Welsh Government is ignoring the private sector in the hope they will 'demonstrate their goodwill'. "So, we're asking Iceland to show they're not a company from outside who just want to make money out of local people, but that they take pride in their roots. We're calling on them to make full use of the Welsh language in their new store – starting with the signs, but moving on to using both languages in their everyday services, offering a full Welsh language service to their customers."